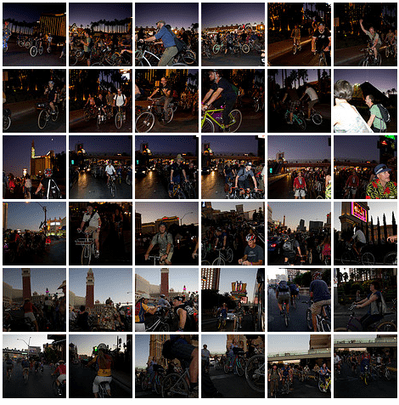 We had a fabulous time at the Bike Hugger Mobile Social Interbike 2009. Thanks so much to our partners Novara, REI, Globe and Dahon. We’ll write more about this after we’ve slept a bit and get all the images into the Hugger Flickr stream, but in the meantime, here’s the Flickr group of the images I shot of us riding down the Las Vegas strip and hanging out at our VIP tent course-side at the Crits. We were thrilled to meet so many of you all (we had more than 250 people attending our booth, including Gary Fisher). We gave away a ton of schwag and raffle prizes, including Hed Wheels, Sun-Ringle wheels and a fantastic Novara bike. This ride was by far the best part of Interbike for me, so thanks personally to everyone who made this such a great night.